Valentine’s is the worst. Most single people are just plain bitter about being alone. No, your 3 cats do not count as companions. You are alone. And the lonelies try to kid themselves into acting like they don’t mind eating three Lean Cuisines and gulping down Riunite Lambrusco straight from the jug, by themselves, on the most ‘romantic’ holiday of the year. We thought it would be a good idea to avoid all the couples, scowling singles, expensive dinners and clichéd long-stemmed roses. This year, stay in and cook for yourself and your “other.” It doesn’t matter if “other” is your boyfriend, girlfriend, mistress, manstress, lesbian life-partner, mother, neighbor, friend, roommate, or aforementioned cats. Hell, your “other” could even be you. Eating two filets on Valentine’s night in front of a mirror never hurt nobody. 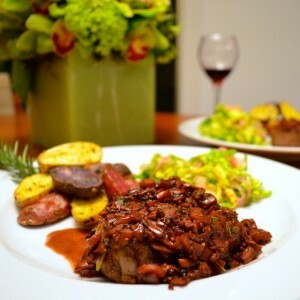 However you add it up or define it, we have come up with the perfect dinner for two. These steaks are amazing, and what man (or lesbian) doesn’t love a good chunk of red meat served up with potatoes? Be sure to read the ‘game plan’ so everything comes out at the same time. Your dining companion will be so impressed with the delicious meal and expert timing, you’re bound to get the good loving. The kind with the TV off and everything. Heat heavy, cast iron skillet over high heat until very hot, 3-4 minutes. Meanwhile, pat steaks dry with paper towels and season all sides with salt and pepper. Sear steaks in pan on both sides, about 2 minutes per side, 4 minutes total. 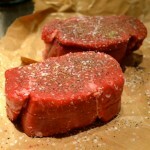 With steaks still in pan, top each filet with a tablespoon of butter. Immediately place skillet into preheated oven. Cook the steaks until they reach 120 degrees for rare or 125 degrees for medium-rare on an instant-read thermometer, about 8-10 minutes depending on thickness of cut. 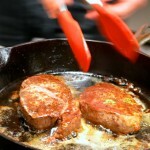 Remove steaks from skillet and set on a plate and cover with aluminum foil. Set aside and let meat rest for 10 minutes. After the steaks are removed, heat skillet over medium-high heat. Add mushrooms to pan and sauté for 5 minutes. 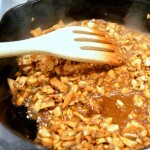 Add shallots and cook for an additional 2 minutes, stirring frequently. 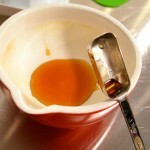 Add wine and chicken broth, increase heat to high and boil for 4 minutes, stirring occasionally. 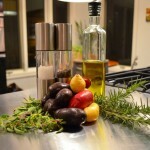 Add mustard and balsamic vinegar, cook for an additional minute. 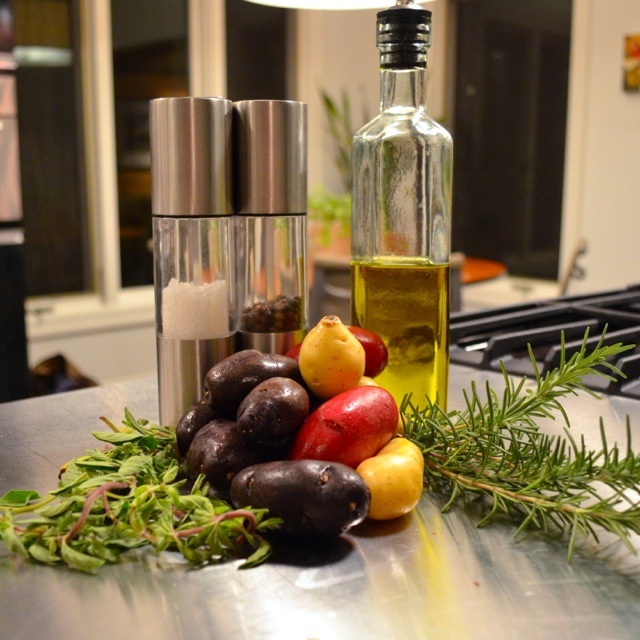 Remove from heat and stir in oregano and butter to thicken. Serve over steaks. In a large bowl, toss all ingredients so the potatoes are evenly coated. 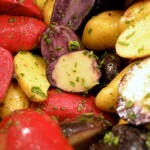 Spread on a rimmed baking sheet and bake for 20 minutes or until tender when pierced with a fork. Serve hot. In a small bowl, combine syrup, red wine vinegar, salt and lime juice. 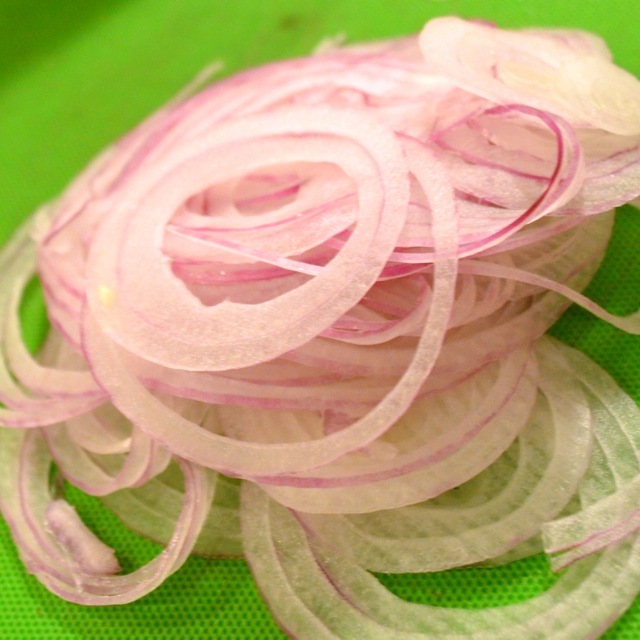 Using a mandolin slicer, thinly slice the onion into rings (about 1/4″), place in the vinegar mixture and set aside. 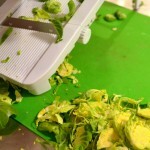 Next, slice the Brussels sprouts very thinly. Using your fingers, lightly break apart the sprouts so they resemble a slaw. Place in a large bowl and set aside. 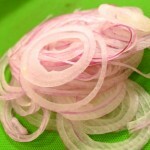 Toss onions and liquid with sprout slaw and serve immediately. 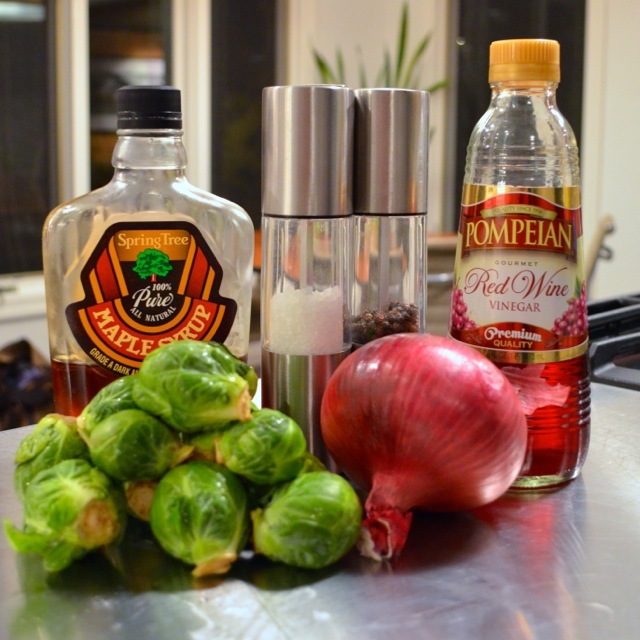 Tossing too early will cause the sprouts to wilt like crazy. First, preheat oven to 500 degrees. 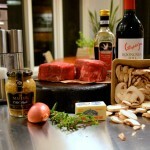 Remove filets from refrigerator, unwrap and place on counter to bring to room temperature. 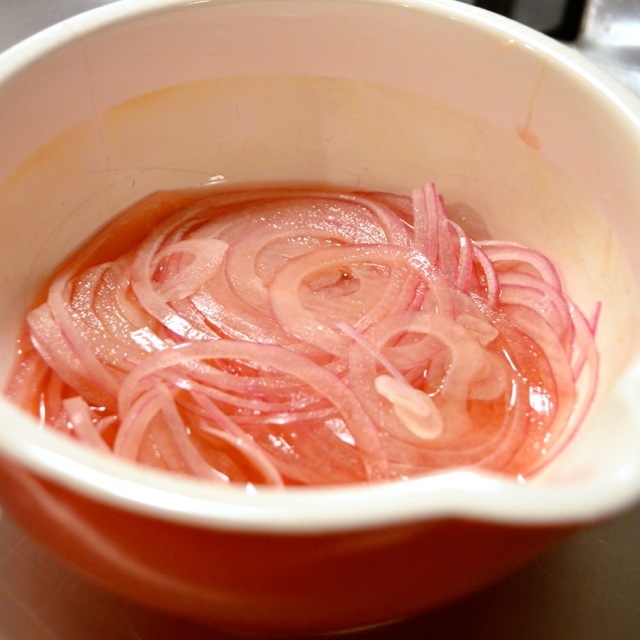 Next, slice onions and place in pickling mixture and set aside. Prepare potatoes as directed and place in oven to roast. While potatoes are cooking, season steaks with salt and pepper, and slice up Brussels sprouts and chop mushrooms to get ready for sauce. 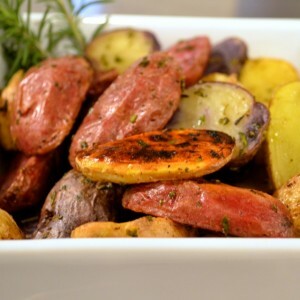 When potatoes are finished, set aside and reduce oven temp to 400 degrees. Heat skillet, sear steaks, then place in oven. You now have 8 minutes to chug a glass of wine. Go. When steaks are finished, remove from skillet and place on a plate and cover with foil to keep warm. 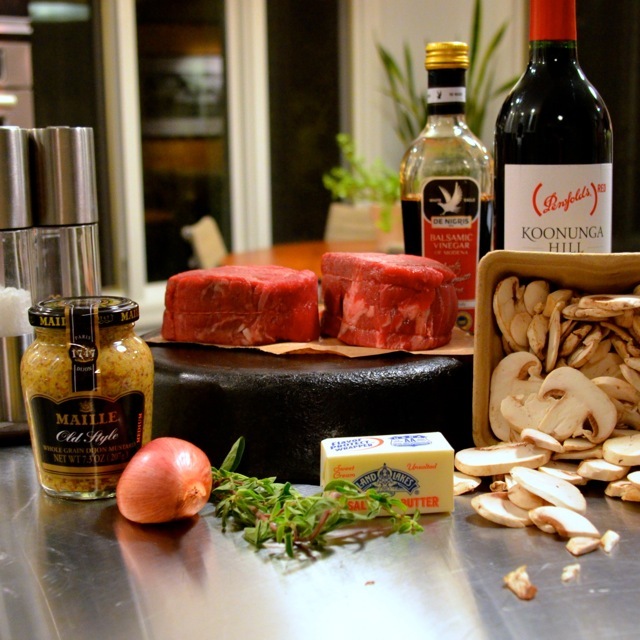 While skillet is still hot, begin making mushroom sauce. While sauce simmers, toss sprouts with onion mixture. By the time the sauce is finished, the steaks will be rested, the potatoes will still be hot, and you’ll be nice and tipsy. Gurl… Go get you some!